遼寧龍的腹部，紅點表示腹腔內的魚類殘骸。Credit: Ji et al. 2016. 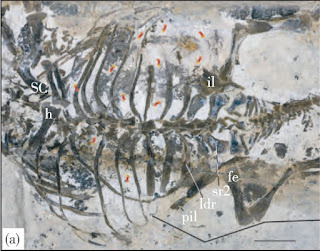 Xu X., Wang X.-L., and You H.-L. 2001. 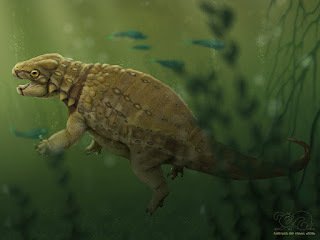 "A juvenile ankylosaur from China". Naturwissenschaften, 88(7): 297-300. Ji Q., Wu X., Cheng Y., Ten F., Wang X., and Ji Y. 2016. Fish-hunting ankylosaurs (Dinosauria, Ornithischia) from the Cretaceous of China. Journal of Geology, 40(2).